Ultra Rare (Japanese: ＵＲ（ウルトラレア） Urutora Rea, or simply Ultra) cards are identified by having a gold card name and a holofoil image. The card name can also be red, but these are only available in Japanese promos. The odds of getting an Ultra Rare in a Booster Pack was around 1:12 in Booster Packs before Soul of the Duelist. From Soul of the Duelist onwards, the odds became around 1:24. Reprint sets released after Soul of the Duelist such as Dark Revelation Volume 3 use the 1:12 ratio. After Tactical Evolution the odds dropped back down to 1:12. 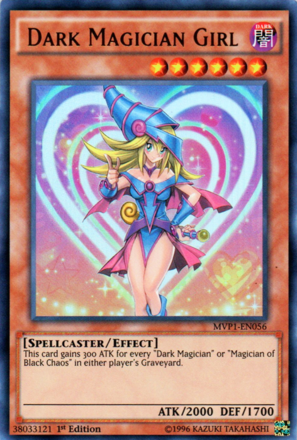 In the oldest OCG packs, such as the first Premium Pack, almost all cards are Ultra Rare. In earlier pre-constructed decks, both Starter and Structure Decks, there is one card (except Structure Deck: Dragonic Legion/Dragons Collide Structure Deck which contains two) printed in Ultra Rare. Later Structure Decks, such as Structure Deck: Master of Pendulum/Master of Pendulum Structure Deck, have more than 1. These are usually the featured cards of the deck and the highlight of their collection. However, these cards are always predetermined, so it's entirely for appearance and not rarity. The chance of getting Ultra Rare cards in Duelist Packs is 1:12. The chance of getting Ultra Rares in Booster Packs was originally 1:24, although this was changed to 1:12 later on. In 2016 this ratio was once again changed to 1:6. Ultra Rare cards are often more valuable than other cards, because they are harder to find and usually more useful. See also: "List of Ultra Rare Cards"
In Yu-Gi-Oh! BAM, Ultra Rare cards and are identified by (Series 1), (Series 2) or (Side Series). These cards have a cost of over 250 or ranging from 5 to 29 . After the new shop update on August 8, 2013, these cards have a cost of 2 to 22. In Yu-Gi-Oh! Duel Arena, cards that are Secret Rare are displayed and counted as Ultra Rare cards, with seemingly the same "pull rates" as other Ultra Rare cards. This page was last edited on 16 August 2017, at 13:17.